A.S.P. REFERENCE MINOTAUR was designed at the request of customers that desired the excellent attributes of the Zyklop, in a more compact and flexible cable. It is better suited for use with all types of audio and video equipment that have less demanding power requirements, and that will benefit greatly from linear precise and silent current delivery. In most respects the Minotaur is on par with the Zyklop’s EMI/RFI rejection, mechanical damping and overall sonic presence that only AeroStrand Ultra conductors can provide. 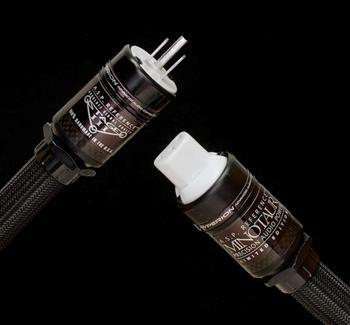 A.S.P.REFERENCE MINOTAUR power cables employ 6 palladium/silver alloy AeroStrand Ultra conductors (2.5mm x 0.55mm) for each polarity in a large tubular helix geometry with alternating positive and negative conductors. Air dielectric with FEP Teflon air tubes. 100% radiation invulnerable shielding uses exclusive H.D.A. (High Density Alloy) foil, plus silver plated copper braid, with individually protected ground. Multi-layer construction with silica/ceramic/ferrite mechanical damping layer. Custom handmade polymer-filled, carbon fiber plug housings help eliminate external vibrations. Exclusive Hyperion Ceramic plugs with Silver/Copper alloy electrical contacts, Palladium plated and Cryo-treated (custom made by Stage III Concepts).